Anxiety in small dogs is a common thing. After all, if the entire world seemed to be looking down on you, wouldn't you feel a little anxious yourself? Learn to identify the signs of anxiety and the best ways to help your dog handle it. We've all seen nervous pets from time to time. It may be that perpetually trembling Chihuahua, or that cute Toy Poodle who would willingly take a nip out of you as soon as look at you. Then there are those poor little creatures that can't bear to be separated from their special person for even the shortest amount of time. All of these behaviors are typical signs of anxiety in small dogs, so let's explore them more closely. Anxiety in small dogs is expressed in many ways. Do you recognize any of these behaviors in your own pet? You've probably experienced this particular show of anxiety in your own pet or someone else's. It usually happens after you've been separated for a few hours, or when someone new enters the house. The little dog scuttles around frantically wagging its tail, lowering its head and leaving a trail of urine all over the floor. This behavior may be spurred in part by a weak bladder, but it is really more of a submissive gesture from your dog. Rapid, prolonged panting is a sure sign of anxiety or distress in your pet, and it is often accompanied by drooling. 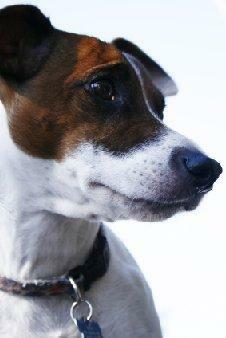 Yet another expression of anxiety in small dogs, trembling can range from mild to severe. Some pets will only tremble when under some form of duress, such as when approached by strange people and animals, or during thunderstorms. Other dogs will tremble at the slightest noise. Trembling is also a common symptom of separation anxiety. This behavior is also known as pancaking. As your dog approaches you or someone else, it lowers its belly to the ground and creeps forward on its elbows and haunches. This is a submissive gesture similar to nervous urinating. Some small dogs express their anxiety through aggressive behaviors such as snarling and snapping at anyone or anything they perceive as a threat. Many dog behaviorists believe these pets are overcompensating for their small stature with big reactions designed to fend off what they see as larger aggressors. So what can you do to try to coax your pet out of these behaviors? You might not be able to eliminate them entirely, but here are a few tips to lessen the severity of your dog's reactions. If your dog is one of those nervous wetters or belly crouchers, you can help play down your pet's anxiety upon your return by acting nonchalant. Instead of reinforcing her over-excitement with the "big hello", ignore her for a little while without greeting her. Simply go about your business and wait for her to calm down. This sends her the signal that there's nothing important going on here. Hopefully she'll take her cue from you, calm down, and take the stress off her bladder. Nothing makes a small dog more nervous than a flighty owner. If you want to instill your pet with confidence, act with calm confidence in all situations. Give your pet someone he can depend on when he's feeling less than secure.Extend this same approach to aggressive displays from your pet, meet all snapping and growling with a firm "No". This is usually enough to get the point across to a small dog, and you can avoid breaking his trust with unacceptable physical punishment that will only teach him to fear you. If something in particular is upsetting to your pet, try to take his mind off of it by offering a pleasant distraction. If your dog dislikes having company in the house, take him to another room and offer him one of his favorite dog treats. If he freaks out during a thunderstorm, try closing the shades and putting on some classical music to help drown out the noise. In some cases, your vet may find it appropriate to prescribe tranquilizers to help calm your pet in the most stressful situations.For example, some dogs are terribly anxious about riding in cars. They may refuse to get in, or they may soil or vomit in their crate or on your upholstery. A doggie version of valium or Dramamine, or an herbal sedative may be required to take the edge off your pet to make the journey bearable. Keep in mind that all medications of this type should be used sparingly and under your veterinarian's supervision. It's hard to completely eliminate anxiety in small dogs once they've taken hold, but by resisting the urge to play into your pet's fears you can help lessen his anxiety. Try this approach as your first step in addressing the problem and follow up with your vet if you truly feel it's necessary.